EMBRIO (‘Enhancing Marine Biodiversity Research in IndOnesia’) is a network initiative initiated by the Vice Rector for Research & Collaboration of the Bogor Agricultural University (IPB), Indonesia, to promote scientific innovation based on marine biodiversity resources and to strengthen counteractions against marine biodiversity loss. EMBRIO aims to grow into an Indonesia-wide network with strategic international partners and a ‘Center of Excellence’ in Indonesian Marine Biodiversity Research. The EMBRIO Initiative is coordinated by the IPB Faculty of Fisheries & Marine Sciences (IPB-FPIK). 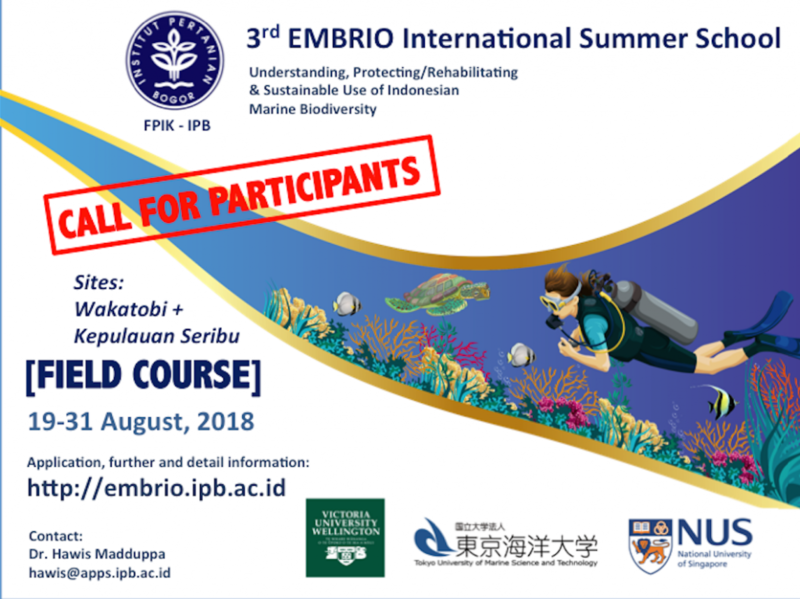 The research training in the frame of the annual EMBRIO Field Course is based on the EMBRIO Goals “Understanding, Protecting / Rehabilitating & Sustainable Use of Indonesian Marine Biodiversity”. In August 2018, the 3rd EMBRIO Field Course will be conducted as an international summer school on the topic “Coral Reefs in Transition”. The training modules of this course will provide a general introduction to common field study techniques (e.g. sampling, monitoring, and species identification) as a background for understanding and protecting/rehabilitating coral reefs and adjacent ecosystems. The course participants will gain a comprehensive overview of the species diversity and their interactions in a functional coral reef ecosystem. The immense value this biodiversity holds for biotechnological innovation will be highlighted to create a fundamental understanding among the participants of the significance to sustain this treasure for future generations. The field course is organized by EMBRIO Faculty of Fisheries and Marine Sciences Bogor Agricultural University (IPB-FPIK). It is going to be held in close partnership with coral reef ecology experts from the School of Biological Sciences, Victoria University of Wellington (VUW), New Zealand. Course participants from Indonesia and New Zealand will work in project teams at a variety of field sites in Wakatobi, Southeast Sulawesi, and Kepulauan Seribu, East Java. Additional participants from National University of Singapore (NUS) and Tokyo University of Marine Science and Technology (TUMSAT) are joining the 3rd EMBRIO Field course. Highly motivated Undergraduate and Graduate Students who are eager to gain hands-on experience in marine ecosystem research and comprehensive theoretical foundation for their scientific career in the field of understanding, protecting/rehabilitating & sustainably using Indonesia’s marine biodiversity. – Explain if you need course-support!